Of course the '73 to '77 doors are the same. I have a '77 door and a '75 door on my Elco project. The windows are different from Chevelle to Elco of course. Power or manual locks/windows? I'm just south of Indy and have 3 sets. Some cleaner than others but all usable if you have a little time and body work skills. BBC - is the piece under the column the same for an El Camino? 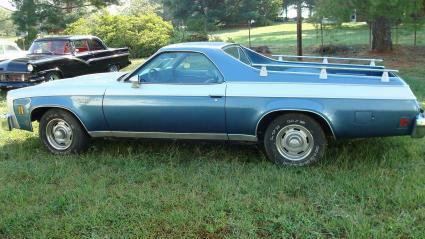 There is a 76 Camino being parted not too far away and as I recall it had A/C. I could head over tomorrow to check it out. Post a pic or email me what one looks like to ga1ofeach@yahoo.com. I have everything you need. In fact I have like 4 of the a/c vent pieces . What color is your interior? A/C vent pc under the column are the same for '73-'77 whether El Camino, Chevelle/Malibu/Laguna, GMC Sprint or Monte Carlo. Brainstain wrote: I have everything you need. In fact I have like 4 of the a/c vent pieces . What color is your interior? I have a black one with a pretty nice vent that still has chrome on it. I'll get pics when I get home. I didn't know the door glass was different in El Caminos and Chevelles. How are the different? Different pillar shape. Funny cause the doors are the same (I'm pretty sure). Yes, the rear of the glass has a different form, or curve to it. I have a Malibu also for comparison, which is how I noticed it. In fact, I have to find a passenger side glass for my Malibu some time. A friend was "helping" me when I sand blasted the firewall etc, and the blast hose & nozzle got away from him ! I have a streak of "frosted" glass on that side. I have one side already pulled. Can't remember which side though.